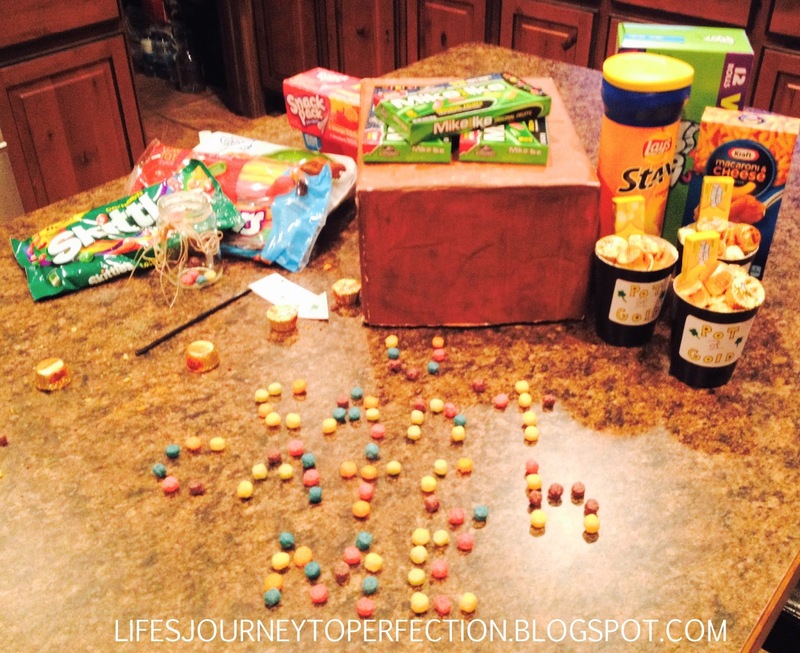 Life's Journey To Perfection: The Trap was set....but did we catch the Leprechaun?? The Trap was set....but did we catch the Leprechaun?? As a child I remember little green footprints trailing through our house leading us to some treat that the leprechaun would leave behind. Excitement would fill the air when we would find what he left for us. Some legends state that if a leprechaun like you then he will take you to his gold. Others state that you have to catch the leprechaun before he will take you to his gold. Before I became a mom, I knew that I wanted to make holidays special like my mom did for us. To create the magic, that little kids minds flourish on. To use creativity and imagination to create a world, a world where rules like reason, reality and even gravity don't apply. A world filled with excitement and anticipation. So, as they stood around the trap in anticipation, they all volunteered me to lift up the box to see if it was in there. But once again we came up empty, no leprechaun!! We always have such kind leprechauns that visit our house though, they always leave something behind on their way out. 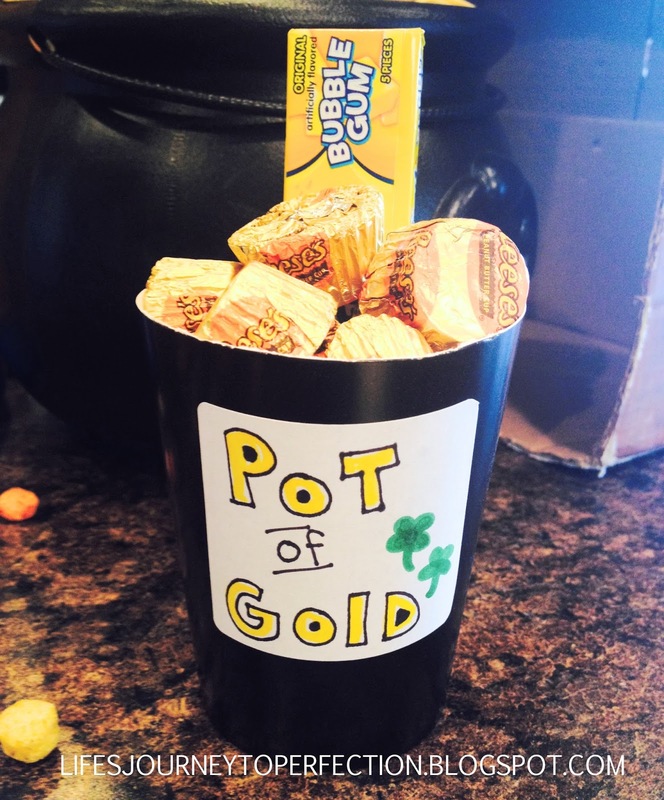 This year our leprechaun left us a trail of Trix crumbs and peanut butter cups, Pot's of gold (peanut butter cups and gum), "golden" chips, and rainbows of candy. 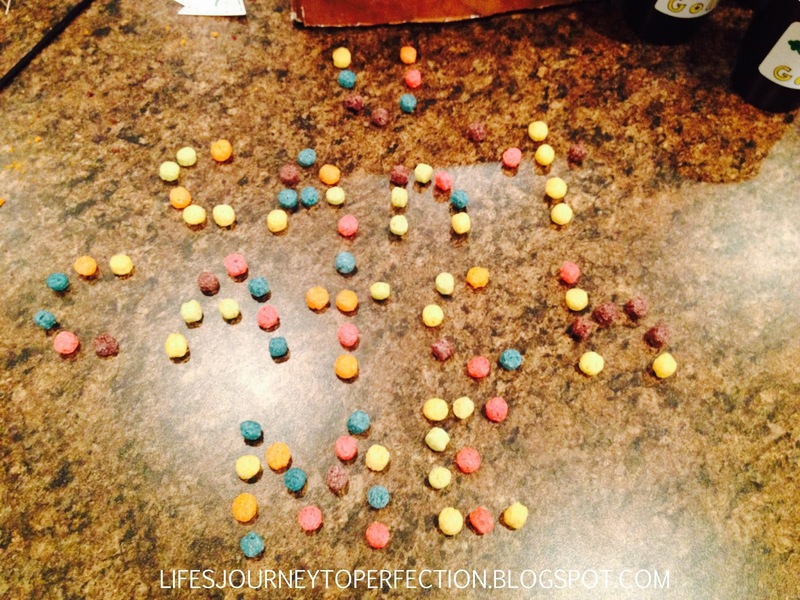 He also left us a message that says, "U Can't Catch Me". Well, there's always next year!! Thanks Mom! You are the best example of creating memories and making occasions fun!